The people gather the magic books together, and burn them to ashes. PHESUS WAS A large city in Asia Minor, not far from the sea. In this city were many people who worshiped an idol, or goddess, called Diana. A great temple had been built in this city for the worship of this goddess, and many heathen people in other parts of the world had sent money to help build it. When the temple was finished it was called one of the seven wonders of the world, because of its rare beauty. Not every one who lived in Ephesus worshiped the goddess Diana. Some Jews lived there, and they had built a synagog. Here they met on Sabbath-days to study the Old Testament scriptures. One day a man came to Ephesus from Alexandria, a city of Egypt. This man, whose name was Apollos, was a Jew. He had heard about the preaching of John the Baptist; and believing that John was a prophet sent from God, he taught the Jews in Ephesus John's words. And some of these Jews also believed, so he baptized them with the baptism of John, to show they had repented of their sins. But neither Apollos nor these other Jews had ever known Jesus. Aquila and Priscilla, the friends of Paul who stopped in Ephesus when he journeyed on to Jerusalem, heard Apollos preach. They saw how earnestly he taught the people and they believed he would become a great preacher of the gospel if only he knew all about Christ. So they invited him to their home and told him more fully about Jesus. And Apollos believed their words. Then he bade his new friends goodbye and sailed to Corinth, where he found the Christians who had believed through the teachings of Paul. Shortly after Apollos went away from Ephesus, Paul arrived on his third missionary journey to heathen lands. He met the Jews who had believed the teachings of John the Baptist, and he preached more about Christ to them. They believed Paul, and were also baptized in the name of Jesus. Afterwards Paul told them about the Holy Spirit whom God sent to believers, and when Paul laid his hands on these men and prayed, they, too, received the gift of the Holy Spirit. For three months Paul taught in the synagog at Ephesus, proving by the Scriptures that Jesus in the Christ. But many who heard him were unwilling to believe in Jesus. They spoke unkindly about Paul and about the Christ whom he preached. Then Paul took his believing friends and departed from the synagog, going to a school near by. In this school he taught every day for two years, until his teaching was known all through the city and the country around. And many believed in Jesus and were baptized. While Paul was teaching in this city he worked special miracles in the name of Jesus. He healed many who were sick, and cast out evil spirits from many who were possessed of them. When he could not visit each needy one who wished to be healed, their friends would carry handkerchiefs or aprons from him and lay these upon the bodies of the afflicted, and the sickness and evil spirits would depart. Many people were filled with wonder when they saw the great power of God as shown by this man. But here were seven wicked Jews who were brothers. These brothers used to cast out demons by spells and charms. They had seen Paul cast out evil spirits in Jesus' name, and not knowing the power of God that was in Paul, they supposed they could cast out evil spirits in the name of Jesus just as Paul did. So when they found a man in whom an evil spirit dwelt they said to the evil spirit, "We command you to come out, in the name of Jesus whom Paul preaches." But the evil spirit answered, "Jesus I know, and Paul I know, but who are you?" Then the spirit caused the man in whom he dwelt to leap on these wicked brothers and beat them terribly, until they fled from the house in shame. Other people soon heard what had happened to these brothers, and they feared the great power of this mighty Jesus. They praised God by speaking respectfully and reverently of the name of Jesus. And many who believed were also afraid when they saw what had happened to these seven wicked Jews. Before Paul had preached to them they were superstitious, believing in signs and in dreams. Many had practiced works of magic, trying to perform great things by these works; but not they confessed their wrong-doing and forsook those evil practices. Books in those days were very rare and expensive. A single book would cost a sum of money that poor people could not afford. But many people in Ephesus had books that taught how to work wonders by magic. When they saw the great power of God they no longer cared for these books, and they believed they should not keep them. So they brought them together in the street and built a hug bonfire with them, even though the books had cost much money. 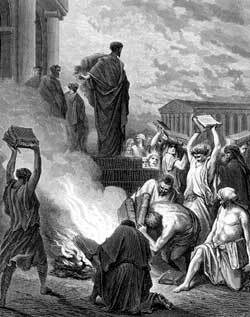 A large crowd gathered round to watch these expensive books burn to ashes. They knew the people who owned these books now believed in Jesus, and would no longer try to practice the wicked works which magic books teach.